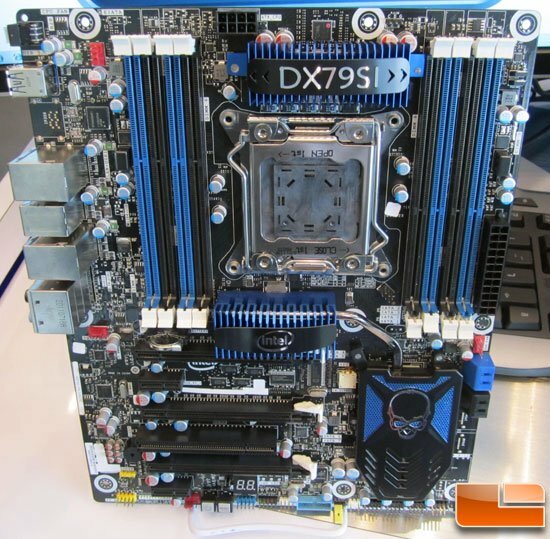 Legit Reviews snapped photos of Intel's DX79SI motherboard, you can check it out over here. Intel will be supporting quad-channel memory on this platform and we you'll find not four, but eight DDR3 DIMM slots on this enthusiast motherboard. The LGA2011 socket has a backplate with threaded holes, so mounting most aftermarket CPU coolers should be a breeze as you shouldn't have to remove the socket or the backplate. Notice that the CPU socket is surround by passive heat sinks on two sides and then memory modules on the other sides. Running tall or large aftermarket CPU coolers might be an issue with this design, so it doesn't surprise us that Intel has announced the Intel RTS2011LC CPU Water Cooler as that solves the clearance issue.